Production started in Portugal in 1980. Initially the Mokes were very similar to the last of the Australian Mokes - indeed, at first they were built from Australian ‘kits’. 1986 marked a major revamp when the distinctively ‘Portuguese’ Mokes were introduced. The Australian-style Mokes with their 13 inch wheels were dropped. Although Cagiva planned to transfer production to Italy, they never did. The last Moke was built (in Portugal) in 1993. Once the tough Australian-style Mokes had been discontinued, the smart Portuguese Mokes made their mark from 1986. First and foremost, the mechanical components were brought into line with contemporary Mini practice, which included 12-inch wheels (by now the standard Mini fitment) and the return to standard-length rear radius arms. Utilising standard Mini parts brought savings for the manufacturer as well as good parts availability for the customer. A full-size roll cage was introduced, making it possible to have 3-point inertia-reel seat belts for all four occupants. The hoods and sides-screens were modernised and conventional, well-shaped, adjustable seats were installed. Things like reversing lights, fog lights, hazard flashers, 2-speed wipers etc became the ‘norm’. Lever comes from a square-shaped opening offset to one side of the tunnel. The same set up (but using rods shorter than on the Mini) as on all rod-change Mokes. 13 inches, until the Australian-style Mokes were discontinued. 12 inches thereafter, using standard steel Mini wheels with plastic trims. Drums all round until 1986, then discs front/drums rear. Deflector screens either side of the windscreen were metal-frames glass. Battery compartment had a lockable, hinged ‘door’. There was normally a lockable compartment behind the rear seats. These were like the Australian-style ‘roo’ bars, front and rear, but the dimensions were slightly different. Mounted in the left-hand ‘pannier’, with the filler cap on the side. The Australian-style Mokes were not built with zinc-galvanised steel, as used by the Australian factory! However, Portuguese Mokes from Summer 1988 were treated with a form of galvanising dipping process. Like the Mini, the Headlamps incorporated the side lights, while the indicators were separate round lamps. A large, rectangular combined unit was introduced. Separate fog and reversing lights were offered (one of each). On the post-1986 Portuguese Mokes, conventional seats with reclining back rests and full fore-and-aft adjustment were fitted at the front. A double-folding bench seat or double-folding single seats were fitted in the rear. NB - in some markets, the Moke was designated a 2-seater, so no rear seats were fitted and the rear foot-well was blocked off. As more standard Mini parts were adopted, the 3-spoke soft plastic Mini wheel appeared. On some model the speedo was also flanked by oil pressure and temperature gauges. A parcel shelf was fitted on either side of the instrument panel, with a black rubber liner. Where fitted, the heater was the compact but powerful Mini unit, mounted just below the instrument panel. Multi-function Mini-style twin stalks took care of the lights, horn, windscreen wipers and washers. Black rectangular mirrors were fitted to the 4cm extensions on the front wings They had sprung arms and elongated bases. 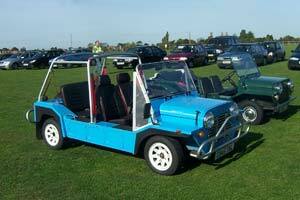 These were probably the most useful mirrors fitted to a Moke. Unfortunately these distinctive mirror units are no longer available; and the glass, if broken, is not replaceable. A Mini central rear view mirror was fitted to a special box section at the top the upper windscreen frame. Leaving aside the Australian-style folding hoods, The Portuguese Moke came with an all-new hood design which fitted directly to the full-height roll cage. The factory hood came with a metal bar at the rear, which was attached to the rear panel. At the front, there was an angle-section bar which was held in place by levers to the top of the windscreen. The hood was then tensioned to the roll cage. Full side-screens could be attached (by zips). These side-screens incorporated ‘doors’ that roll up (or, roll sideways, in the case of Cagiva hoods). Check our Portuguese Moke Hoods for our own design of hoods for Portuguese Mokes, which we think are neater and more practical than the factory hoods. The change from the Australian-style low-back roll cages to the Portuguese full-height roll cages meant that 3 point inertia-reel seat belts could be fitted for all four occupants.